Peterborough United have revealed details of a family fun day and a family open day at the ABAX Stadium. On Monday, April 6 (Easter Monday), Posh take on Walsall in a League One fixture at the ABAX Stadium and the club have discounted under 18 tickets to just £1 with a full paying adult in the Family Stand and the Motorpoint Stand. The club will also stage events before the game. There will be a bouncy castle, a bull ride simulator, face painters, balloons, a cake stall from the fantastic Compendium 74, caricature artists in the concourses and a double decker play bus. There will also be an Easter Egg hunt with legendary Posh mascot Peter Burrow at 12pm. There are 30 places available for this hunt and tickets (which cost just £2) must be purchased in advance from www.theposh.com or at the Posh Ticket Office. Tickets for the game can also be purchased from those locations. All the fun begins from 12pm. 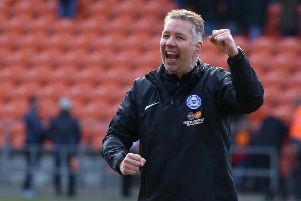 And on Sunday, April 12, there are a host of events at the club open day including the chance to watch a first-team training session and a Q & A with all members of the Posh management team including manager Dave Robertson and coaches Aaron Mclean and Grant McCann. 10.30-11am - youth team training session on pitch. noon-1pm - first team training on pitch. 2-3pm - first team signing session in sponsors’ lounge. 3pm & 3.30pm - ground tours (advance bookings only). 3-4pm - Q & A with management team in the Venue. The stadium tours throughout the day will be the only access into the home changing room, board room and control box. Tickets for these tours MUST be purchased in advance, costing £1 for U16s and £3 for adults these can be purchased at www.theposh.com The following activities will also be available. *Tour of the first team coach. *Armed forces will be present. The following stalls will be manned. Car boot stalls are priced at £6 for cars and £10 for vans, Gates open to set up at 8am with the public due to attend from 10am. To book your place please call 07530 971581. The general public will have access throughout the stadium except for the back room offices, tunnel area, board room and the control box.